My dinner club had another meeting and I tried a new wine, or so I thought. My club was meeting once again at The Courthouse Grille in Plymouth, Michigan. We have had several meetings there, because they fit our criteria very well for what the group requires. We require a private dining room to hold our meeting, and this restaurant has several rooms beyond their dining room and bar/tavern. We also require a restaurant that can offer us a variety of entrée dishes that have to be better than decent, if they want us to return. Most of the venues had figured out that a Wednesday night of thirty or more men for dinner along with cocktails and wine are worth a little extra effort and so far we have been pleased. I have written about The Courthouse Grille and some of the other names this restaurant has been associated with it. Our abbreviated menu for the members this past meeting was more than adequate; some venues let us pick three different dishes, but The Courthouse Grille offers us a fine selection that is chosen ahead of time by our hosts for the evening. The menu for that evening was Veal Marsala, Shrimp Scampi Roma, Grilled Salmon, Sautéed Perch, Chicken Piccata, Lasagna and a New York Strip Steak. The meals come with the appropriate vegetables and starches, along with a salad, fresh baked dinner rolls and a Chocolate Sundae for dessert. I had the luxury of having several heavier dinners that week when I was with my Bride, so I opted for a lighter dinner that evening and chose the Sautéed Perch that was sautéed with capers and lemon and served over a roasted vegetable risotto. The dinner was a winner, and I did remark that the Veal Marsala that a couple of the members at the table I was at, looked great, and they also said that it was done to perfection. I had started off the evening with my traditional Whiskey Sour during the Cocktail Hour prior to the meeting and the dinner. During this time, I was also requested and received a wine list from one of the servers that was taking care of our group, and this restaurant has a very fine selection of wines by the bottle. Since I was not hosting, I was looking at the wines by the glass, as not to be onerous to the evening’s hosts. 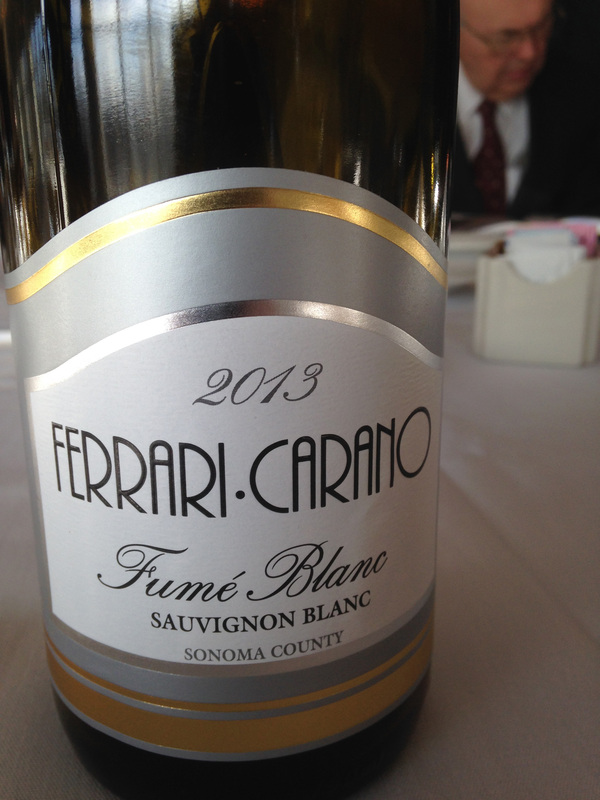 There was a white wine listed as Ferrari-Carano Fume Blanc 2013 and I decided to order a glass of it for dinner. I have had many wines from Ferrari-Carano over the years and they are a good dependable winery. This wine was from Sonoma County and the grapes were harvested from Dry Creek, Alexander and Russian River Valleys. This was all fine and good, now onto this mystery varietal Fume Blanc, that I had ordered. Fume Blanc is a marketing name coined by Robert Mondavi for Sauvignon Blanc, which at the time was suffering an image problem, as most people were associating this varietal for a sweet white wine, which it can be when it is in the production of French Sauterne. It can also be a dryer white wine, when it is from Graves in Bordeaux or from the Loire Valley of France. It is from the Loire Valley that Robert Mondavi created this wine term of Fume Blanc playing on the reputation of Pouilly-Fume. The most remarkable thing is that several other wineries including Ferrari-Carano have jumped on the band-wagon and call their dry Sauvignon Blanc Fume Blanc. They also tend to make the wine more in the tradition of the Loire Valley by using both Stainless Steel and used French Oak barrels for the production of the wine, and I also have to say that Fume Blanc is not a trademark name, just one that has been used and accepted; and there are no actually regulations or requirements for this “proprietary” name. This entry was posted in Dining, Wine and tagged Alexander Valley, California, Dry Creek Valley, Ferrari-Carano, Fume Blanc, Russian River Valley, Sauvignon Blanc, Sonoma County. Bookmark the permalink. So, did the wine measure up? How did you like it? I have had some moderately priced ‘Fume Blanc’… so far, not a big fan of this California wine personally. I had this wine a couple of years ago and was really pleased with it. But I tried the latest vintage a month or two ago and was not as impressed. I was so disappointed!